Essential Oils….They are essential! Essential Oils….They are essential! I’ve dabbled in Essential oils here and there for quite a while now, but never really researched or was consistent in using any. I’m finding more and more that these oils are extremely beneficial and have so many uses. They can be applied to the skin, used for aromatherapy, infusions, lotions and soaps and some can also be ingested. One of my favorites is Lavender oil. It’s extracted from the flowers of the Lavender plant. It’s a very calming and relaxing. It has been used to promote sleep. Some people use a drop or two on their pillow before going to sleep. It’s so effective that it can be used to help with stress and anxiety. Lavender also has antiviral and antibacterial properties. You can put it direction on the skin and it could speed up healing time of cuts, scrapes. So many uses. Just walk through the grocery store and you can find Lavender added to many products. Lavender bleach is a product that comes to mind, because who wants to smell bleach while it’s being used to clean. Another good oil with similar uses is Chamomile. You can add it to tea or other hot drinks. Chamomile tea has long been used to help with stress, inflammation, cramps, and to help induce sleep. You can also put a few drops of oil on the bottom of your feet for a more restful sleep. Great news! There are some oils that could be beneficial for weight loss! According to dr.axe.com, “If you’re looking to essential oils for weight loss, I recommend grapefruit oil, cinnamon oil and ginger oil. Sometimes you can get these in compounds, or you can use these three individually. You can put one single drop of each in water and drink it that way, or you can actually put it on topically or diffuse it. When you’re putting it on topically, I recommend using a carrier oil like coconut oil, especially when using the cinnamon oil. Or one of my favorite ways is just diffuse it, such as on your desk at the office or around your home. It has a great scent. It will activate parts of your body that will support weight loss. Another oil that I always have at home is Frankincense. Frankincense comes from the Boswellia trees and was being used even before modern medicine came up with anti-inflammatories. Some of its uses can include, antiseptic, anti-inflammatory, disinfectant, relief of stress and anxiety, and immune system booster. 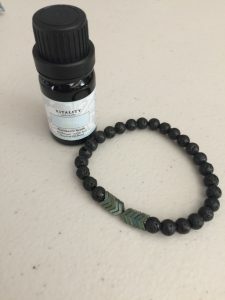 Again, Frankincense can be diffused, a few drops can be rubbed on the bottom of your feet, it can also be mixed with a carrier oil of your choice and put on scraps, and cuts. Also, just an FYI, if any of you take Osteo Bi Flex for your joints, look at the ingredients on the back. You will see Advanced Boswellia Serrata Extract. Yup that’s it! You can find some great information on Boswellia here https://draxe.com/boswellia/. One of my new favorite oils is called, Calm. I purchased it from Vitality Extracts, along with the arrow diffuser bracelet. Ingredients include Mandarin oil, Lavender oil, Tangerine oil and German Chamomile oil. It has a great scent and these are the perfect blend of calming oils. I put a few drops on my bracelet and it’s lasts all day, sometimes two. I’ve only touched on a few Essential oils here, but there are so many more with amazing benefits. I encourage you to research oils for any condition that you may have. You may be surprised at how a simple little bottle of oil can help you. You will find that Essential oils are available from many different sources. I have chosen to go with Vitality Extracts. The have some great oils at reasonable prices and they have some really cute diffuser jewelry. Wherever your search leads you, Essential oils can be a welcome part of your daily routine! Disclaimer: None of the information in this article constitutes medical claims or medical advice. If you plan on using, or ingesting oils, please do your own research. Some oils require a carrier oil when ingested or placed on your skin. If you have any medical condition or take medication for any condition, always check with your medical provider.